Organisational membership is available to Higher Education and research institutions internationally. Other organisations with a commitment to the development of researchers may be eligible for affiliate membership. See our pages about membership. Enquire about membership for your organisation. 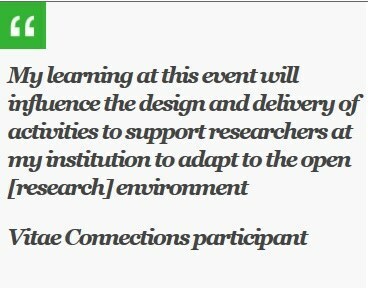 Most of our events are aimed at those with responsibility for supporting the professional and career development of researchers. As well as our annual international researcher development conference we run a series of smaller Vitae Connections events dedicated to sharing practice and continuing professional development, each having a specific theme. A springtime series of networking seminars is one way for our members to input to our programme for the following academic year. Our programme of events is based on input from our members. We provide leading edge, high quality training courses, specifically designed for researchers, and train the trainer programmes to build sustainable capacity for your organisation - using a variety of delivery methods. Get in touch if you'd like to discuss ways we could help you. Partnering with organisations on funding bids. Contact us to enquire about consultancy. We work in many ways with other organisations with a stake in researchers' professional development. Recent partnerships have included co-development of new resources, joint research projects, event sponsorship, mutual promotion agreements and paid advertising. If you have a great idea for how we could work together, we'd love to hear from you! This online app is a powerful professional development tool that can help individual researchers to identify strengths, action plan, review achievements and create a portfolio of evidence. It's available through subscription to organisations or to individuals and is designed to be portable if the user moves roles. The Planner is based on the globally acclaimed Vitae Researcher Development Framework. Vitae organisational members are eligible for a discounted subscription. Organisations can also request a free trial and can purchase a subscription for all or for a sub-set of their researchers. Read more or get in touch to enquire about subscription options or to arrange a discussion. Vitae's membership programme was launched in January 2015 and after just one year we're delighted to say we have over 160 member organisations and growing. We have a strong membership base in the UK encompassing a wide variety of universities and research institutes, including those who are research intensive and those building research capacity. We've also been expanding internationally with many new member organisations from across the world. Annually we hold a round of networking seminars and on-line exchanges so that members can share their ideas for topics to consider for next year's programme. 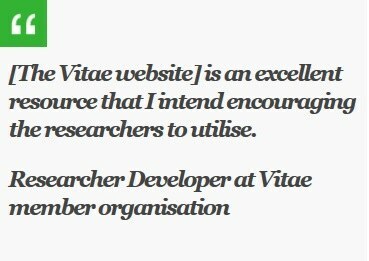 Organisational membership makes Vitae available to everyone in the organisation and we provide resources to enable all staff and researchers at member organisations to make the most of their membership. For the past 2 years we’ve been working with ACU, AAS and 29 African institutions from 9 countries on the CIRCLE Fellowship programme. We're helping institutions build research capacity through strengthening their policies and provision for researchers, their careers and their professional development. We're also supporting a dynamic group of early to mid-career climate change researchers with professional development planning and mentoring. The CIRCLE fellows have been able to learn from our experiential approach and long experience working in researcher development. Cohort 1 (of 3) has just completed their fellowships and it’s been incredible to see the formidable progress made by these driven researchers. The first 29 fellows have published 49 papers in a variety of journals since the start of the programme, exceeding expectations, and strong inter-university collaborations have been formed. A majority of our member organisations use the Vitae Researcher Development Framework as a way to review or even to organise their training and development provision for researchers. When we asked individual researchers how they use it, lots of them told us it’s overwhelming so one of the ways we came up with to make it more accessible is 'RDF lenses’. These can help you to see, straight away, the knowledge and skills most important in a context such as teaching, leadership or enterprise. It’s also been a great opportunity to work with lots of other stakeholder organisations such as the Leadership Foundation for Higher Education, the Engineering Council and the Association for University Industry Links. We’re always pleased to hear from members with ideas for new lenses!